Click the link then print out and return to, Woodcock Cycle Works on 157 St. Anne's Road, Winnipeg, Manitoba R2M 2Z5. If you do not have Adobe Reader, you may easily download the application by clicking the Get Adobe Reader image; this product is free. ** Preregistration is $20 but race day registration is $25. For our out-of-town racers - Again this year the Norwood Hotel is the official hotel of Icebike. They have offered racers a special rate ($69 + tax per night), just mention that you are with the Icebike race. For accomodations that are only a 5 minute walk to The Forks please click on the Norwood Hotel icon on our sponsors page. This year we are selling long sleeve shirts, that are $17 each and can be ordered on the entry form until January 26th. 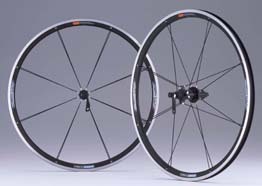 We are raffling off a wheelset at this year's event. It is a Shimano WH-M540 Mountain Bike Wheelset with 16 spokes/wheel and sealed bearing hubs. Each racer's entry will get a draw ticket and additional tickets can be purchased for $2 each.